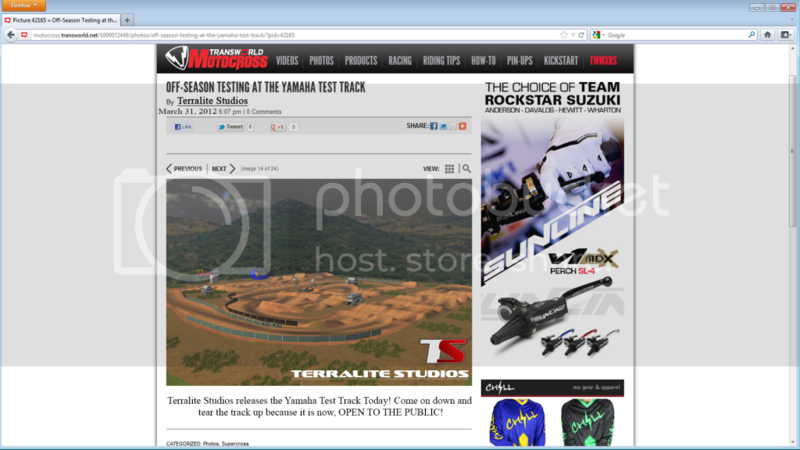 We release the Yamaha Test Track to the PUBLIC! Come out and ride with us at 76.217.164.83 server tonight. We welcome all types of riders! Many of you have probably been wondering if i will do the rest of the factory test tracks, and the answer is... YES! So look forward to them coming. If you want to contribute i will put your name on one of the objects on the next released track! Everyone on the Terralite Studios Race Team! KTM Test track felt a bit horrible to ride but overall was a good effort. Hope this rides better and has more line options sure looks it from the picture. Pumaxcs wrote: Easy as juan too tree. DAMN PUAL! you mustve been so busy making these tracks. great work with both of them! Im having some issues with the first 2 jumps. I can go on-off so do i just clear them? kona309 wrote: Im having some issues with the first 2 jumps. I can go on-off so do i just clear them? mackan25 wrote: You work fast mate! ya two entire days, working nonstop. I think you're rushing on making these tracks. Take time to read everyone's tips and help on how to make your tracks better. You don't want to be known as the guy who rushes on tracks and only does 5 laps then releases it. The on-off sections are weird because it's made for just quading, not actually jumping on and off of them. You should test out the smaller lines first, then the bigger lines with come later. This track has smaller lines, but is meant for the biggest lines because you made the track doing the bigger lines. The burms are easy to rail, but to easy. This is a test track, to test riders capabilities, not some easy as track. The whoops are hard, but too hard. You want people to love the hardness of the track, not not hate the hardness of the track and never want to ride it again. On a a 5 scale rating, I'd give it a 2.5.
i dont see what you guys are talking about with the first to jumps, i can step on step off on a 250 easily. sometimes i case them but you just gotta go a little slower than gas it real hard on the top.